The following article was posted on my friend Paul Wilkinson's blog, Thinking Out Loud. Check out his site here. The future never looked as bright as when you know you’ve reached bottom and there’s nowhere lower down you can go. I hope it was a great sermon! Another good friend sent along the following comment in response to this post. She is a solid Christian whose opinions I respect so I add her perspective for your consideration. Let me also add that I posted the above article with my "tongue partially in cheek" because of the subtle humour that was present. "...but in all likelihood, it will consist of “heads in the clouds” platitudes." I find that sad, David, that you would assume such a thing about a church you do not attend and a pastor you do not know. Frankly, it breaks my heart into pieces. God uses different means to help different people. Those groups on the sign are helping people who, at this time, would rather die than attend a regular church service. These groups often have to pull up people from their despair, their death wishes, before they can even find the strength to seek to live and desire God. God is huge. He thinks outside the box. He uses all sorts of people, all sorts of ways, to help all sorts of people. What works for one will not work for absolutely everyone. Yes, ultimately Jesus is the answer for us all. Yes! But the ways He brings us to Himself are many and varied. And the ways He keeps us whole and joyful and healed *after* we know Him are many and varied, too, and He has pastors out there showing us how to stay healthy in spirit, soul and body so that others will want what we have. And it behooves us to respect the people He creatively uses to pull people upward from their despairing aloneness so they can glimpse--and desire-- His light which will ultimately expose their darkness and bring them to Himself and a joy in living. As the author of the piece that David used, I want to say that there was no intent to be judgmental toward a particular pastor. As I stated in the first paragraph, I have no idea if the photo is real or somewhat staged. All I wanted to say was that sometimes, in the face of need all around us, as the Monday thru Saturday schedule at that church demonstrates, it's easy for there to be a disconnect on Sunday morning. The weekly sermon often misses the hurt of the community. We all share in that. 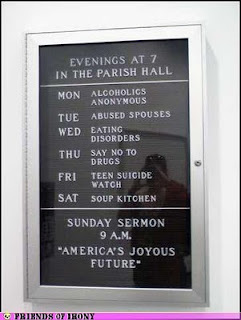 If you'll look carefully, you'll see that I ended with, "I hope it was a great sermon!"